Fire warms the heart and in many cases you will require fire to purify water. Therefore being able to quickly start a fire is an essential survival skill. Carrying a wood burning stove in your go bag and a means of starting the fire in it is the first step on your progression to primitive. A good wood burner is essential for backpacking and cooking on the fly. If you are traveling you will find your wood burner to be very convenient compared to building an actual fire. My favorite is the Zip Ztove. I have lived off a Zip Ztove for over a month cooking two meals a day and purifying water. The key is to kep a handful of tinder and afew dry twigs handy to start the stove in wet conditions. There are several other methods for building your own wood burner as seen on zenstoves.net. A new edition is the Biolite stove which charges a battery from the heat of the fire and even has a USB port which you can use to charge your phone and other devices. My favorite wood-burner, the famous Zip Ztove. 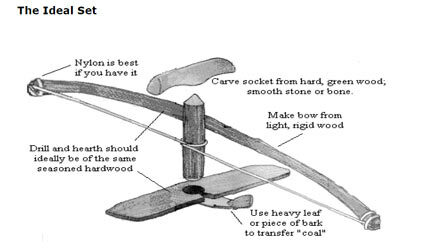 The bowdrill is the easiest of the friction fire methods. If you intend on learning friction fire starting this is the first skill to master. The bowdrill can be made relatively quickly. Wood Test: Press thumbnail into wood. If it dents cleanly it is good bowdrill wood (medium hardwood is best).There are 6 basic parts as illustrated in the drawing below: 1. Spindle 2. Fireboard 3. Handhold 4. Bow 5. Tinder and 6. Coal Transfer Mechanism (paper, leaf, or bark). Should about as big around as your thumb. There should not be knots at the ends. Top should have longer/narrower point. Thickness should be equal to spindle thickness. Should be comfortable with no sharp edges. I LOVE stone handholds. If you have a little extra time to peck out a depression in the right kind of rock, you can have a permanent handhold that needs no lubricant. It greatly reduces friction and extends the life of your spindle. Hole should match pointy end of spindle and can be packed with lubricant. Should be rigid and have little flex. Light is beautiful, bowing with a heavy bow is just more work. Bow at a moderate pace until notch is filled up with sawdust. Then, operate more vigorously heating dust up to 800 degrees and starting a coal. Spindle should be set up on outside of string. Set up board with notch over a coal collector that you can use to easily transfer the coal to your tinder bundle. I used to recommend putting the tinder under the fireboard. Since I have noticed that this can compress your tinder and cause it to absorb moisture from the ground. Its usually better to make a coal and then tranfer it to a fresh and fluffy tinder bundle. When ready to remove fireboard place blade of knife over notch and lift away board to not to upset coal. Or tap the fireboard as you lift if away from the coal. Don't blow directly on coal intitially, moisture in breath will not allow it to ignite. Just fan your coal lightly until you see it start to glow. The top of the spindle can be lubricated with fat/oil, pitch, body grease (collect from side of nose) or green leaf. Pitchy greens are best. Pine needles are great! Spit or water does not make a good lubricant. The main disadvantage of the bow drill is that it requires cordage (in the bow). Cordage is one of the more difficult materials to come by in the wild. There exists another method for making friction fire without cordage. This method is much more difficult to master yet mastery of the hand drill will allow you to make fire with two less components. Therefore, once you have mastered the bowdrill, the hand drill is the next logical step and mastery of the hand drill is an incredibly valuable skill. Good spindle woods include: Horseweed, Evening Primrose, Mullien, Cattail, and Elderberry. Good Board woods include cedar and Basswood. Hand drilling positions vary from person to person. I have found for me, the best position is that shown in the illustration below. I have found you really don't need to brace the fireboard. Wet the stalk by spitting on your hands and running it over the stalk before starting. Start slow, you may need to get the burnish off of the stalk before you see smoke. Once you have smoke, maintain for a little while before going hard at it. Never take downward pressure away from the drill. If you need to reposition your hands hold the stalk down with one hand, change position, one hand at a time, switching which hand holds the stalk. Be realistic, cold and rainy days may not be the best days to bust a hand drill coal if you are in a survival situation. A longer stalk may give you better "stroke". If you are having trouble with handrill, try a longer stalk.